Click for a PDF version of the EzFloMix™ brochure. Pigment concentrates are essentially a dispersion of inorganic and organic color particles in a suitable vehicle. Traditionally the vehicles are resins that are compatible with the system it is being used with. Historically polyester resins were colored with pigments dispersed in a polyester vehicle, epoxy resins with an epoxy vehicle and polyurethanes with a polyurethane vehicle. The key technology breakthrough for EzFloMix™ Kerox Universal Pigments was the engineering of a multi-compatible polymer resin, through the incorporation of surface active molecules into the polymer chain. These surface active molecules attach to the color pigment particles by London-van der Waal attractive forces. Stabilization between pigment particles takes place by Steric Effects between the polymer chains. The new polymer chain with surface active molecules have an excellent affinity for all three of the commercial polymer resin systems - Polyester, Epoxy and Polyurethane. It's through ingenious application of Physical and Reactive Chemistry that this product is a market reality. Kerox Universal Pigments have low viscosity. This makes the product flowable straight out of the jar. This convenience enables the end user to add the pigment to their resin systems easily and accurately. A further benefit is the quick and fast mixing of the pigment into the polyester/epoxy/polyurethane resins. 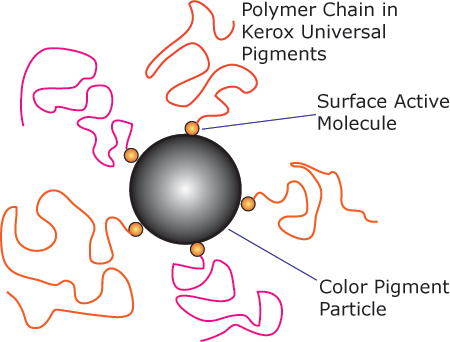 The surface active molecules in the color dispersions polymeric chains makes this possible. These advantages decrease manufacturing time and increase the overall productivity. Carbon Blacks, Phthalo Blues, Phthalo Greens, Organic Reds, Yellows and Violets are notoriously difficult to disperse, because of their small particle size and large surface area. This results in thick pastes for legacy pigment dispersions. The EzFloMix technology from Kerox solves this problem. You don’t have to deal with thick and difficult to handle pastes anymore, just pour and mix our flowable colorants. EzFloMix™ Kerox Universal Pigments have excellent color stability, uniformity and zero color separation. The color hues don't change whether you use unfilled or filled resin systems. EzFloMix™ - coloring with a blend of titanium dioxide white and phthalo blue dispersed in a polyester resin casting at 10% usage. Castings are uniform in color and exhibit zero color separation. 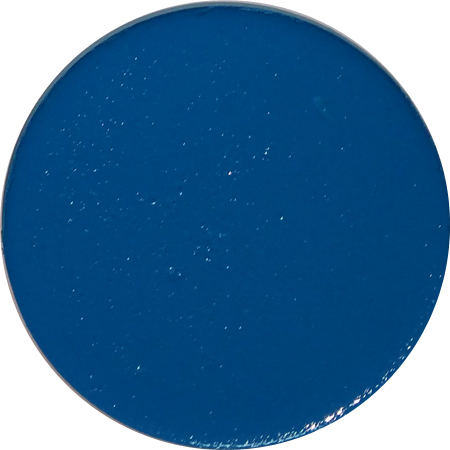 Though phthalo blue has a lower density than titanium dioxide, EzFloMix™ technology ensures uniform color dispersion and uniformity. Without EzFloMix™ technology, legacy pigment with same composition of titanium dioxide and phthalo blue dispersed in a polyester resin casting at 10% usage. Flooding and Floating is seen with phthalo blue rising to the top. 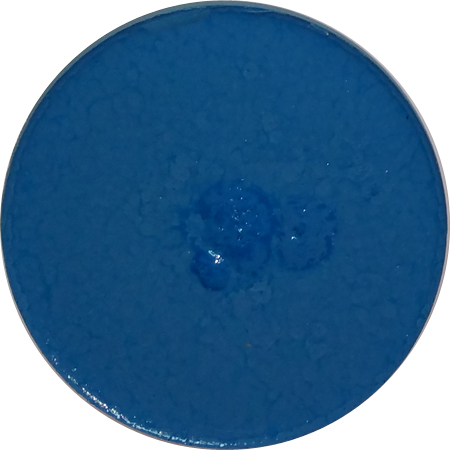 The lower density phthalo blue floats to the surface and the heavier titanium dioxide sinks. Castings exhibit color separation and non-uniform coloring. Another illustration showing the same EzFloMix pigment (right) blend dispersed in a polyester resin casting (left) and a gelcoat casting (middle) at 10% usage. Observe that there is no color separation and both castings have the same color hue. Without EzFloMix™ technology see that the same blend of pigment (right) gives completely different coloring in a polyester resin casting (left) and a gelcoat casting (middle). Poor pigment formulations, such as these, cause lighter phthalo blue to float and denser titanium dioxide to sink, thereby resulting in different color hues in different systems. EzFloMix™ Kerox Universal Pigments are formulated with high pigment loading. From a manufacturing perspective, this means that you can achieve a high coverage, which is coloring area per unit weight of pigment (grams of pigment / square foot of coloring). Further, the EzFloMix™ technology renders the coloring with enhanced gloss. Illustration - Kerox has been manufacturing pigments for over 50 years. On the left is our historic thick paste 312 PO Red Pigment casting made at 10% pigment usage on the polyester resin. With the evolution into the EzFloMix™ technology, we have successfully maintained a high pigment loading. 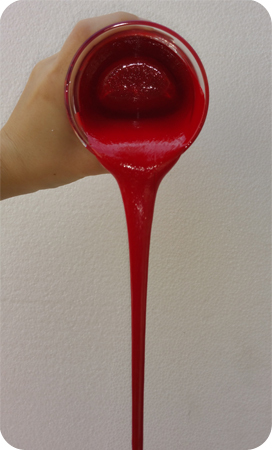 The same 312 PO Red Pigment with EzFloMix™ technology gives a casting (middle) which has identical hue, again at 10% pigment usage on the polyester resin. This shows that EzFloMix™, with its decreased viscosity, continues to give high coloring coverage. To further demonstrate its impressive coloring coverage, a casting (right) made with EzFloMix 312 PO Red Pigment at just 5% pigment usage on the polyester resin, performs exceeding well. Gloss is a key attribute of EzFloMix™ Kerox Universal Pigments and below is a snippet of actual castings made at 10% usage on the polymer resin. EzFloMix™ Kerox Universal Pigments have been evaluated for Outdoor Ultraviolet (UV), Indoor and Heat Stability tests. Indoor Test : These are lightfastness tests carried out under simulated conditions in a carbon arc or xenon lamp fadeometer. The exposure time is 72-80 hours. Outdoor Test: In these tests pigmented panels are exposed to the sunlight in Florida, USA, positioned at 45° and facing south. The ratings are for a 12 month exposure. Heat 15' : In this test the pigment is applied to a metal plate made of either steel or aluminum and then exposed to a temperature of 150° C for 15 minutes. Heat 30' : In this test the pigment is applied to a metal plate made of either steel or aluminum and then exposed to a temperature of 150° C for 30 minutes. The data is presented in terms of the following scales: 8 = No Bleed or Discoloration; 6 = Slight; 4 = Appreciable; 2 = Excessive. Since the range of colors we manufacture is very large, please email us at sales@kerox.org to obtain the data values for your requirement. The 60000 Compliance Range colors provide an elegant choice of colors for your production requirements. Superior research and engineering by Kerox will continue to provide the market with practical solutions to complex regulations and global standards. EzFloMix™ Kerox Universal Pigments are color concentrates with a long storage life. Our product warranty is for 12 months. However, since does not have any self polymerizable components, its practical storage life can run into years. Composites and FRP manufacturing technologies produce products as per market demand. 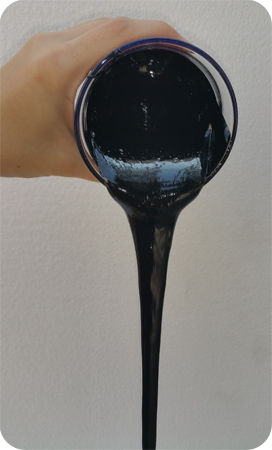 As such, a pre-blended resin with color, has its limitations. For example, consider a large Composites manufacturing Company, holding a large inventory of colored polyester gelocat, or colored epoxy system for flooring, or colored polyurethane system for castings. What happens if the color changes from white to grey? The entire inventory becomes unusable for producing market products. For smaller Composites and FRP companies, pre-colored resin inventory is impractical for market requirements. The color is dependent on customer requirements. Incorporating EzFloMix™ Kerox Universal Pigments in the inventory mitigates this problem. The smaller inventory enables the manufacturer to hold a variety of colors in stock. This smaller quantity of color inventory can readily color any clear polyester resin/gelcoat, epoxy resin or polyurethane resin. Thereby, it facilitates a harmony between practical production and market requirements.